class="post-template-default single single-post postid-332942 single-format-standard custom-background group-blog header-image full-width singular wpb-js-composer js-comp-ver-5.7 vc_responsive"
GARNETT, Kan. — The Kansas Corn Corps Class 2 domestic trip gave participants the opportunity to experience production agriculture and affiliated industry in Illinois, Indiana, and Michigan. The purpose of the trip is to help these young farmers experience and learn about various agricultural industry businesses outside of Kansas and to expand their knowledge about how to effectively communicate with consumers while learning how to think outside the box. 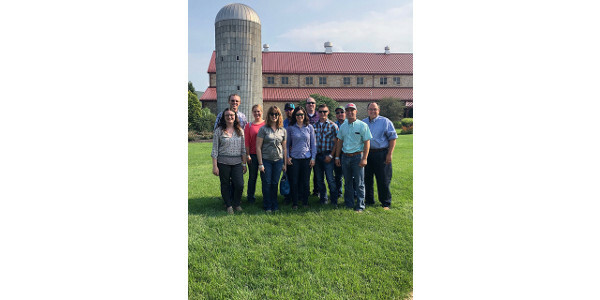 “We have learned how to effectively say the right things to consumers and Fair Oak Farms is a great example of how to do that, they did a really good job,” said Hayden Guetterman, Bucyrus. The final day started out at Carbon Green Bio-Energy ethanol plant where they learned about the plant’s approach on expanding retail sales of higher ethanol blends throughout Michigan. They visited Brookside Farms which they learned about blueberry farming from a third-generation farmer and the marketer who markets produce for their cooperative member. The last stop of the trip was at Fenn Valley Winery and Vineyards in Fennville, Michigan where they learned about the history of the farm and why the western part of Michigan is an ideal grape growing region. “Networking and learning has opened my eyes to see all of the opportunities in agriculture, and to actually be able to see it firsthand has helped to sink in that knowledge even further,” said Garrett Kennedy, Gypsum.